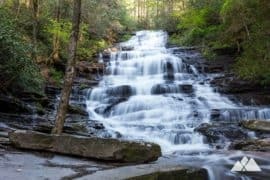 Hike the East Cowpen Trail and Panther Creek Trail to the stunning cascades of Panther Creek Falls, deep within Georgia’s lush Cohutta Wilderness. 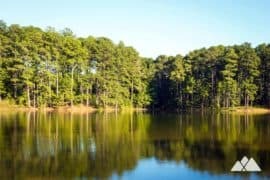 Spanning an enormous stretch of North Georgia, the Cohutta Wilderness is filled with some of our state’s finest forests and wilderness. 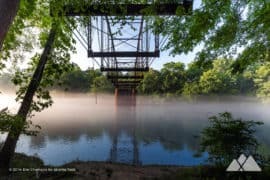 Crystal-clear rivers meander through its remote acres, carving through lush valleys filled with abundant ferns, wildflowers, and blooming laurel and rhododendron. Enormous waterfalls cascade over rocky bluffs, tumbling into deep pools of crystalline water below. Tall mountains reach skyward, offering beautiful views into the valleys below. 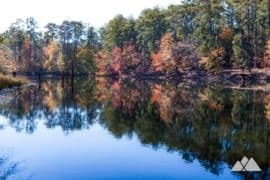 And a number of outstanding trails bisect the Wilderness, offering some of Georgia’s most beautiful, remote, and challenging hiking and backpacking adventures. 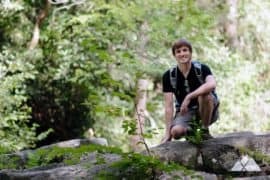 This hike explores a particularly beautiful stretch of the Cohuttas, following two connecting trails through a fern-filled hardwood forest to a rocky creek valley. 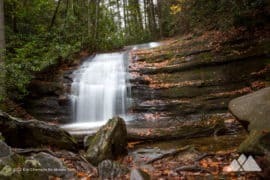 The hike’s highlight is a visit to the tumbling cascades of Panther Creek Falls, catching views of the surrounding rolling mountains from the waterfall’s crest, and spectacular views from the base of the falls. 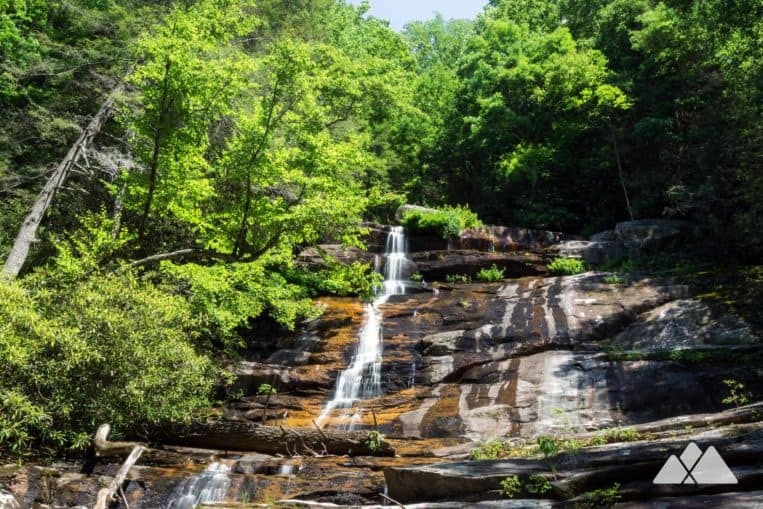 There are actually two waterfalls in North Georgia named for the giant, wild cat that once roamed these mountains. 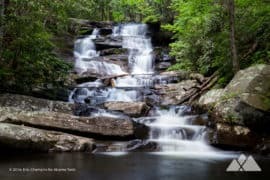 This is not the fairly easy hike to the Panther Creek Falls near Tallulah Gorge – the one that’s the ultra-popular summertime swimming hole and backpacking destination. 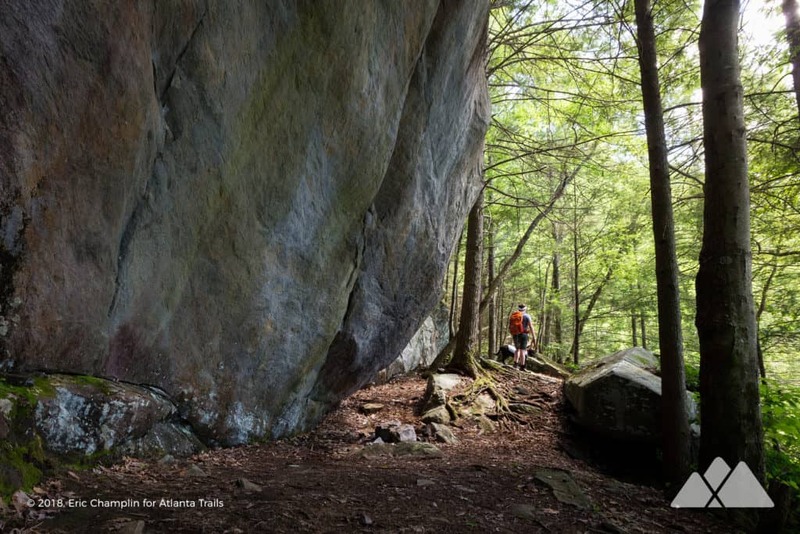 This Cohutta Wilderness hike is a totally different adventure. 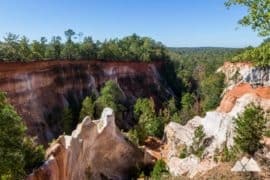 As with many hikes in the Cohuttas, the route to these cascades is much less frequently traveled, offering a more serene and remote experience. 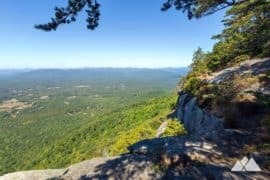 And the views from the crest of the falls, and the hike’s route through a lush forest, make it entirely worth the journey. 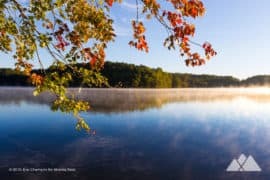 As with most hikes in this vast, remote stretch of forest, this hike is moderately challenging and requires some careful wayfinding, so be sure to pack day hike essentials, a paper map and compass, and don’t rely on a cell phone to find your way. 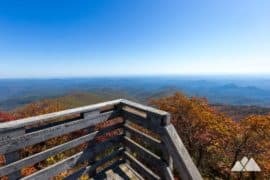 It’s a beautiful hike, rewarding with mile after mile of classically beautiful Appalachian forest, and a refreshing change in terrain from start to finish. And it makes for a fantastic long day hike or overnight backpacking adventure. The adventure begins at the Three Forks Trailhead west of Blue Ridge (view maps and driving directions), following the East Cowpen Trail northbound from the trailhead. The hike begins a steady ascent, climbing through a lush forest filled with towering hardwoods, vibrant-green ferns, and colorful wildflowers. Signs of damage from the 2016 Rough Ridge wildfire sporadically dot the trail. 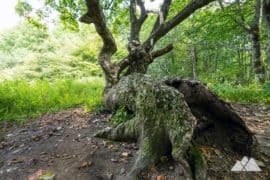 Signs of regeneration are equally prevalent, too, as the forest thrives in its newly-renewed, rich soil. 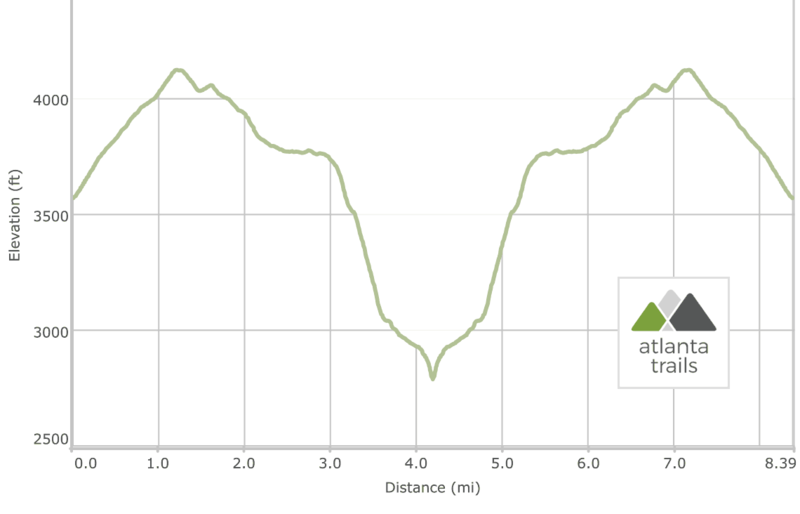 The hike passes an intersection with the Rough Ridge Trail at .4 mile, continuing the climb. Through-the-trees views extend from the trail as it climbs through swaths of dense fern, cresting a small knob at 1.25 miles. The hike descends from the knob, beginning a nearly-continuous descent to the falls. 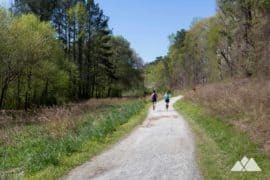 The East Cowpen Trail follows the path of a former highway through the forest, now a narrow gravel-laden path, thanks to the designation of the Cohuttas as a highway-free Wilderness area in 1975. 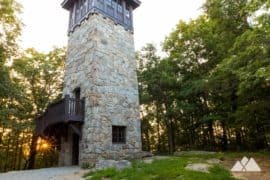 Continuing northbound, the hike passes through sporadic clusters of pine and gnarly-branched mountain laurel, reaching a grassy clearing flanked by backpacking campsites at 2.25 miles. 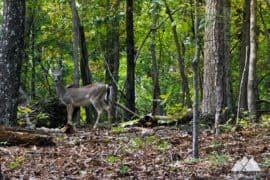 From the clearing, the hike departs from the East Cowpen Trail, following the Panther Creek Trail southbound. 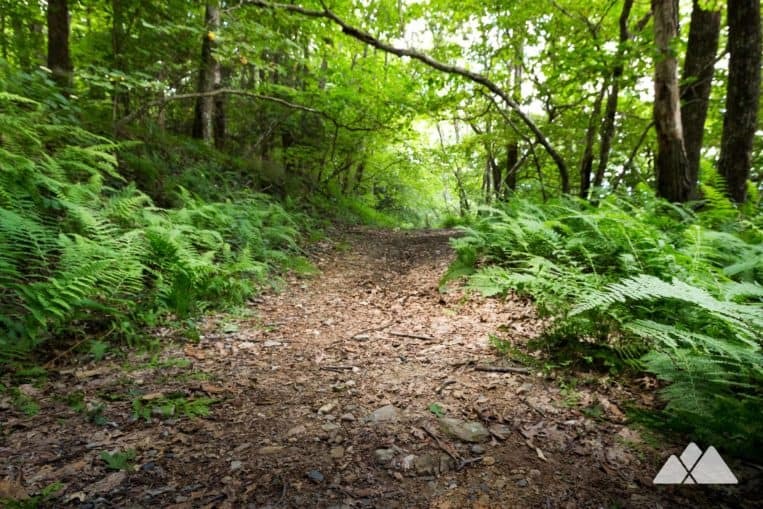 Ferns and wildflowers thrive beneath the hardwood canopy above, carpeting the sun-dappled forest floor. 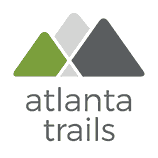 The trail arcs to the west, and the descent to the falls resumes as the path begins to pitch sharply downward. 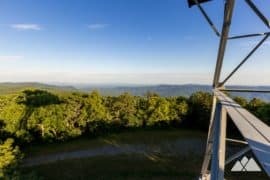 The pungent, onion-like scent of galax fills the air as the trail plunges through a rocky forest peppered with dense mountain laurel and rhododendron thickets. 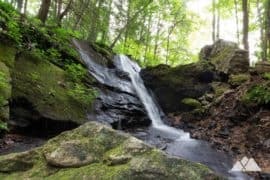 The trail arcs southwest at 3.5 miles, and the sound of falling water echoes through the forest as the hike passes under fragrant hemlock trees. 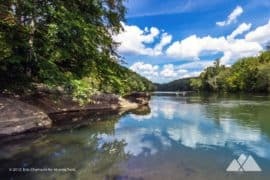 The hike makes several usually-shallow creek crossings beginning at 3.8 miles, passing clusters of campsites just above the waterfall. 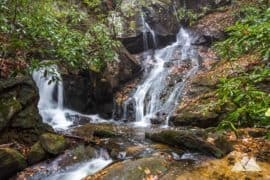 The trail reaches the crest of Panther Creek Falls at just over 4 miles, catching stunning views into the surrounding Cohutta Wilderness from the boulder-laden overlook above the falls. At the crest of the falls, be sure to keep a generous distance from the edge. 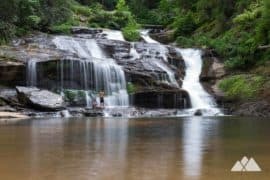 As inviting as the view may be, the waterfall’s moving water and bare rock can be exceptionally slippery, and the dropoff is sudden and steep. 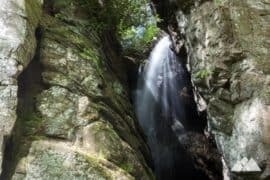 The route to the base of the falls follows a trail to the northwest, descending alongside a towering rock outcropping framed by hemlock and enormous fallen boulders. The trail carves through several sharp switchbacks as it descends, meandering southbound, to the west, and then southbound again to approach the waterfall’s base. The hike reaches waterfall’s base at just over 4 miles. 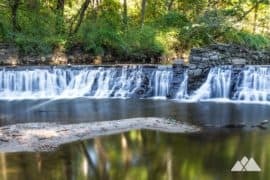 Large, tumbled boulders and fallen trees litter the area beneath the falls, offering the perfect place for a mid-hike breather with a stunning view of the waterfall. 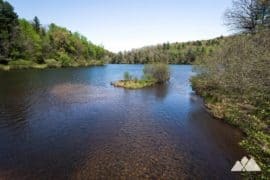 From here, the trail continues following its namesake creek downstream, eventually reaching the lower Conasauga River Trail to the west. 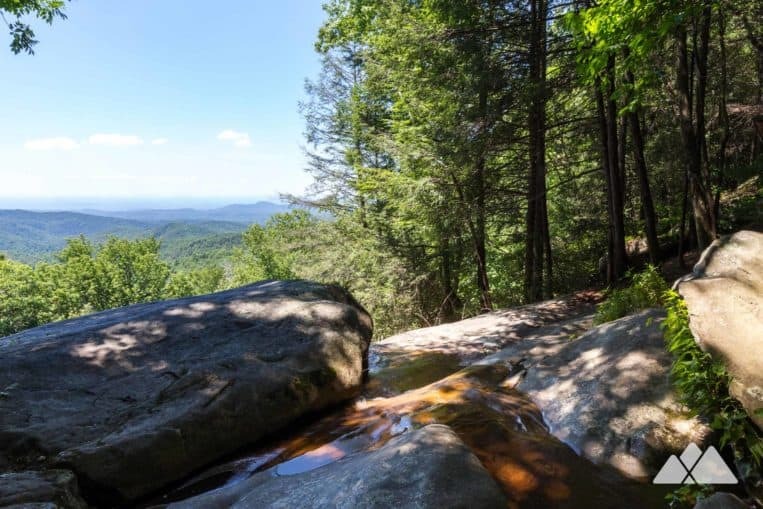 After soaking up the views beneath the towering falls, this hike turns to retrace its outbound route in reverse, navigating to the waterfall’s crest and making a workout-worthy climb to the northeast. Reaching the East Cowpen Trail at just over 6 miles, the hike turns southbound, following the East Cowpen Trail back to the trailhead. 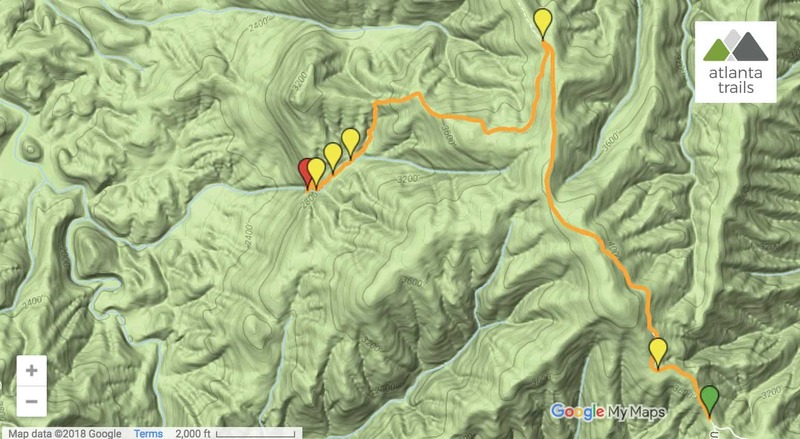 At 8.4 miles, the hike reaches the Three Forks Trailhead, completing the adventure. 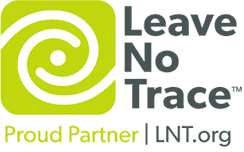 Because this area is so remote, challenging, and the trails are sometimes sporadically blazed or not marked at all, always tell someone where you’re going and pack an official paper map and wayfinding essentials, such as a GPS and compass (and know how to use them if you’re lost). Always pack emergency essentials. 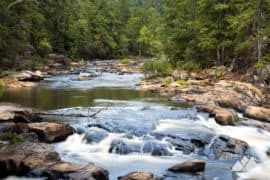 And it’s always best to avoid trails along the rivers and creeks in the weeks following a heavy rain. 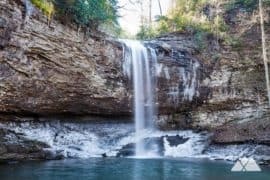 There’s certainly no finer waterfall in the Cohuttas than the enormous Jacks River Falls, located near the Georgia / Tennessee border and most easily accessed by a hike on the Beech Bottom Trail. 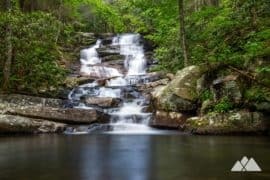 Follow the Jacks River Trail from its southern end at Dally Gap, splashing through chilly creek crossings to a series of waterfalls on this tumbling, clear river. 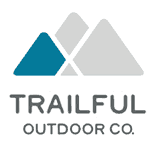 Or check out our Cohutta Wilderness adventure guide for more adventures in this beautiful, remote outdoor wonderland. 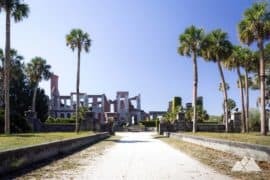 Spending some time in the area? 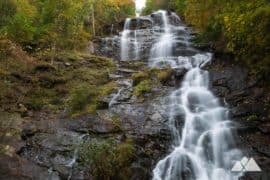 Check out our favorite hikes to waterfalls near Blue Ridge, GA, featuring adventures to some of North Georgia’s most spectacular waterfalls.